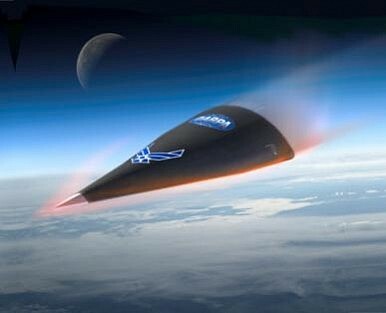 The U.S. effort to produce a hypersonic global strike weapon has taken a big step forward, and a big one back. The U.S. military’s more than decade-old effort to produce a hypersonic global strike weapon just took a big step forward and a big step back. On April 20, the Defense Advanced Research Projects Agency, or Darpa, published the results of an engineering review of a key hypersonic vehicle test. On August 11, Darpa launched Hypersonic Test Vehicle 2, a wedge-shaped robotic craft meant to reach 20 times the speed of sound and travel for 30 minutes. HTV-2, boosted into the upper atmosphere by a Minotaur rocket, flew for only nine minutes before crashing into the Pacific Ocean. A previous test in 2010 using a similar test vehicle also ended in failure nine minutes into the flight. The failure isn’t all bad news. “The result of these findings is a profound advancement in understanding the areas we need to focus on,” said Air Force Maj. Chris Schulz, the Darpa program manager. All the same, the Pentagon has cancelled the HTV effort in order to focus on other hypersonic systems. In November, the Army reportedly successfully flew a cone-shaped robot at Mach 8, less than half as fast as the HTVs. Despite mixed test results, the Pentagon has reaffirmed its commitment to building a combat-capable missile based on the hypersonic technology. In January, the military implied that the so-called Prompt Global Strike weapon could be installed on submarines. Analysts expect the fast, long-range missile – if it ever really works – to play a key role in the Pentagon’s evolving strategy for countering China.